communication systems, space industry and biological analysis1. 3) the absence of electronic design for practical quantum control. new technological solutions compatible with existing technology. technologies and achieve unprecedented functionalities. silicon control electronics, to serial prototypes for innovative industrial applications. number generators, and room temperature single-photon emitters and detectors. as virtual facility in QUROPE - Quantum Information Processing and Communication in Europe. 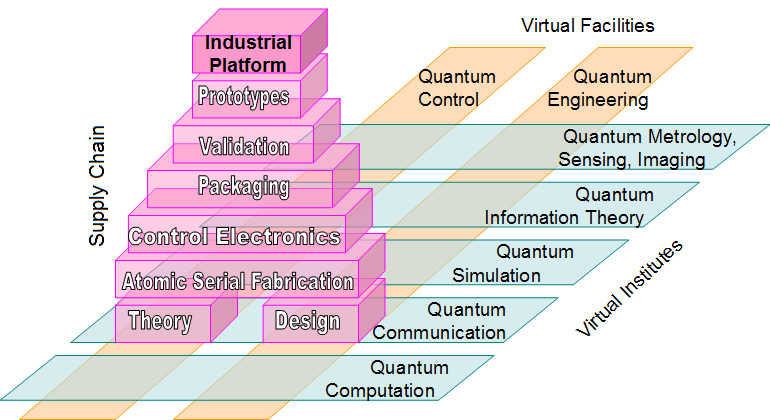 complete supply chain from the quantum technologies to industry. IEMN strongly supports this proposal to extend Quantum Engineering for Silicon Technology to GaN. We were involved in the fabrication of HEMTs based on nanowire and now we are developing transistors based on nanoribbons. GaN/AlN/AlGaN/GaN nanowire MISFETs with 0.5µm gate lengths were fabricated using dopant free GaN/AlN/AlGaN radial nanowires with a high mobility in the range of 3100 cm2/Vs at room temperature. We have also performed measurement of DC and microwave performances. Deembedding of parasitic is critical because of extremely high output impedance. The transistors cut off frequencies were FT = 6 GHz and FMAG =12 GHz. These nanowires were provided by the Harvard University, Cambridge, MA. Devices based on nanowires and nanoribbons are studied to develop enhancement and depletion modes transistors on the same wafer. Top-down and bottom-up approaches are investigated. Bottom-up approach is based on the re-growth of (In,Ga)AlN /GaN nanowires parallel oriented and Top-down approach will demonstrate that by combining conventional (In,Ga)AlN/GaN epitaxy with top-down nanoribbon fabrication, both E-mode and D-mode HEMTs with high performance can be easily realized allowing integration on the same substrate. Transistors based on nanoribbons also permit to develop devices presenting a high linearity. Resonant Tunneling Diodes based on Al(Ga)N/GaN structures and Self Switch Diodes (SSD) with nano-channels were also investigated. -	Detection and Emission in the THz field for imagery or Telecommunication applications based on SSD devices. I think that it is important to extend the scope of this topic other key materials like nitrides. Indeed, GaN is playing a key role in power and high frequency electronics and microelectronics and in optoelectronics. The markets related to GaN are huge (e.g. solid state lightning). Opening this topic from Si to nitrides will boost new ideas in this field. Micro- and Optoelectronics today are based on well established semiconductor technology: ultra high purity material synthesis is leading to ultra high material quality, followed by ultra high precision semiconductor processing. Relevant technologies need ultra large investments. As a consequence, many of the core technologies are in the hands of only a few global players, with increasing tendency for further concentration. In the past, European microelectronics industry has suffered substantially from this continuous concentration, since resources, in particular the ones for consumer microelectronics, have been concentrating systematically in Asia and the US. Loosing access to own European resources in microelectronics and optoelectronics is strategic­ally inacceptable for the European society, since the availability of such core technologies is a prerequisite and main driving force for economical development. Therefore, novel technologies in the field of microelectronics and optoelectronics with potentially disruptive character are not only of great scientific interest, but of great importance for the European industrial landscape, since each of these novel developments is both a new chance for increasing European footprint in such core technologies, and at the same time a big risk to lose further ground. The proposal “Quantum Engineering for Silicon Technology” flagship therefore needs to be fully supported. However, quantum engineering with semiconductor devices is not limited to silicon. Today, Gallium Nitride technology has developed over the last 25 years into a serious technology especially for solid state lighting, and is now extended to high frequency electronics and power electronics. It addresses meanwhile a substantial part of the current revenue of micro- and optoelectronics worldwide, and especially in Europe. Recent developments in GaN technology are based on 3-dimensional architectures with high aspect ratio, like GaN nanorods or nanofins. Core-shell nanorods are meanwhile under discussion as a novel technology for solid state lighting, with substantial advantages in comparison to their thin film counterparts. High aspect ratio 3D GaN architectures are free of extended defects, being the only viable way today to fabricate defect free GaN in an efficient way on larger area substrates. This holds promise that now, based on defect free GaN architectures and a strong technology push can be expected both in optoelectronics as well as HF and power electronics. In addition, recently normally off and normally on transistors have been fabricated in parallel, which is a potential basis for a GaN based “CMOS” type of technology. In other words, GaN is expected to develop into “the second silicon”. Therefore, it is strongly suggested to extend the scope of the present suggestion for a flagship program towards GaN and possibly other III-V semiconductors, in addition to silicon microelectronics: the future world of microelectronics will not be silicon only, but will be based on hybride devices using the advantages of all available material platforms in parallel. The European industry and research landscape has a strong standing in GaN technology. One of the two largest LED manufacturers is Osram Opto Semiconductors GmbH, Germany. Infineon AG is the world´s large power electronics manufacturer, with its largest microelectronics fab in Villach, Austria, Start Ups like GLO (Sweden) and Aledia (France) , as well as OSRAM OS are exploring novel 3D GaN architectures for optoelectronics. Numerous research centers across Europe are doing world class research in GaN technology with a strong international standing, including strong labs in France, Spain, Italy, Poland, Sweden, Germany and others. An extension of the present flagship to “Quantum Engineering for Semiconductor Technology”, including silicon AND GaN, would open the limited scope of the proposal in its present form and include the material platforms of the future. An additional key aspect is that wide band gap materials will be especially interesting if quantum effects at room temperature are to be used. The group of Prof. Waag is mainly working on GaN technology, with an emphasize on 3D GaN nanostructures for future devices. The group, in close collaboration with its European partners, including Osram Opto Semiconductors GmbH, is one of the leading groups worldwide on the MOCVD growth and processing of 3D GaN.